You’ve almost made it through the first week of BTS, and we hope you’re settling into a good groove. Football season is about to begin with the the opening of The Star, plus you can catch all the talent in Frisco, a memorabilia card show, and the winding down of RoughRiders baseball. Make it a fabulous week, Frisco! On Saturday August 27, the Star in Frisco will host a high school football quadruple-header. The action starts bright and early at 9am when Frisco Reedy will play its first-ever game against Frisco Independence. Then, at 12:30pm, Frisco Heritage and Frisco Lone Star square off in a rare District 13-5A matchup to start the season, a game which will be nationally televised on ESPNU. “Museum of American Railroad Walking Tours” – Guided walking tours of the Museum’s new Frisco facility are back! We are pleased to announce the 2016 Summer Walking Tour schedule. Tours will run each Thursday and Saturday at 10am & 11:30am from June 9th through September 3rd. Please phone ahead (214) 428-0101 to check the status of the tour schedule in the event of inclement weather. Tours will last approximately 45 minutes and will originate at the Frisco Heritage Museum (6455 Page Street, Frisco, TX 75034) – just a few blocks north of the Railroad Museum. After paying admission at the Heritage Museum, you will proceed to the Railroad Museum site. Parking is available at the Frisco Discovery Center (8004 Dallas Parkway, Frisco, TX 75034). Admission is $8 for adults and $4 for children ages 3-12, and includes the Railroad Museum’s 2nd floor exhibits at the Frisco Heritage Museum. Please pay admission at the Frisco Heritage Museum approximately 15 minutes prior to your tour. Visitors can browse the Museum store at the Heritage Museum, which features railroad themed gifts, collectibles, books, and electric train sets for all ages. To request pricing for private group tours, please phone (214) 428-0101. “Dallas Card Show” – Sports card, memorabilia, and autograph show! Dealers from Houston and Austin, as well as Oklahoma, Arkansas, Florida, Michigan and Louisiana are scheduled to be at the show. Come out to Buy, Trade and Sell! From Friday, August 26, to Sunday, August 28th, at the Westin Stonebriar Hotel and Golf Club 1549 Legacy Drive, Frisco, Texas 75034. “1st Annual Womens Wednesdays SUP Race” – The first ever paddleboard race in Frisco, Texas, starting at 9am. In honor of our new and exciting program called Womens Wednesdays (where women meet up and paddle together and stay fit every Wednesday), we have decided to host a Womens Only SUP race right before the start of our 7th annual surf contest. Race is designed for beginners, very short around 1.5 miles, and the cost is $30. Every racer will receive a medal and trophies awarded for places 1-3 in 3 age divisions at awards ceremony to follow the race. Don’t own a board? No problem, DFW Surf will be sponsoring boards to use for the race which will be included in your race cost of $30. Click on the Ticket URL link below to register. We will cap race at 40 racers. Stock board class only, boards 12 feet and shorter, no race boards. “Frisco Rotary FARMERS MARKET” – The Farmers Market is back in downtown Frisco with a new location! On 4th Street between Main and Elm, the Farmers Market is open every Saturday from 8am to 1pm or Sell Out. A bounty of fresh fruits and vegetables creates a colorful welcome to those who appreciate the “buy fresh, buy local” idea. Seasonal fruits create a spectacular palette! The freshest vegetables in North Dallas will excite your culinary talents! Also available are pasture fed beef, pork, lamb, and the freshest eggs you’ll find. Buy pasta, nuts, cheesecake, muffins, gourmet items, and honey – all fresh! Check out the vendors page for information on all the vendors. Be sure to come by every Saturday starting in May for the best produce and homemade goods in Frisco. “The Star Kickoff” – Multi-Use Event Center Debuts During August 27th event. The countdown is on to the grand opening of The Star during its August 27 kickoff event. Tickets are required to enter. The Ford Center at The Star is located at 9 Cowboys Way. During recent weeks, several new roadways have opened around The Star, including Frisco Green Avenue and a new section of John Hickman Parkway west of Dallas Parkway. “Frisco RoughRiders vs. Corpus Christie Hooks” – First pitch thrown at 7:05pm in Dr Pepper Ballpark. Please Note: Children aged 2 and under do not need a ticket, but must sit on a lap. “Frisco Young Professionals’ Volunteer at Frisco Fastpacs with Happy Hour Networking to follow at Rock 101 Grill” – At 5:30pm, let’s give back to this great non-profit who gives so much to the children in our community! FYP will be assembling the weekend meal bags at the Fastpacs warehouse on Tuesday, August 30th at 5:30 pm. We will have a networking social at Rock 101 Grill afterwards. Fastpacs is located at 110A Rose Lane, Suite 205, Frisco, TX 75034. We will be collecting food donations of canned fruits and vegetables. The Frisco Fastpacs mission is to ensure that no child in Frisco has to endure hunger when school is not in session. Each week throughout the school year, Frisco Fastpacs delivers weekend meal bags to qualifying FISD students that might otherwise go hungry over the weekend. “Heritage Tourism” – Join us at the Heritage Association’s first meeting after the summer break when Marla Roe, Director of Frisco’s Convention and Visitor’s Bureau, will discuss the tourism industry and how “Heritage Tourism” can provide a unique experience through period clothing and special programming. Other special presentations will be given and refreshments served. Impressive home in Chapel Creek near Toyota Stadium with downstairs MBR, 3 BR up, 5 FP, 5 car garage, formal dining, breakfast, unique two-level study w FP, wine cellar, media room, 2 covered outdoor living areas with outdoor kitchen. 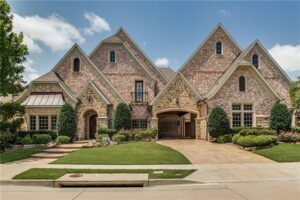 Outstanding Highland Home in Eldorado Fairways. Great floor plan with master suite, study, guest bedroom down; 3 bedrooms, game room, media room upstairs. Hand-scraped hardwoods, Plantation Shutters, 2 staircases, stone fireplace, spacious master with sitting area. Oversized lot in desirable Villages Of Lake Brook Subdivision. Exceptional Southeast Frisco location close to Coit, 121, & exceptional schools K-12. Home features laminate hardwood floors, tile, backsplash, plantation shutters, & vaulted ceilings. PogoPass: Get a $124.95 PogoPass for $49.98 when you use code: FRISCO. Get access to some of the most fun venues around town this summer including the Frisco RoughRiders, Sci-Tech Discovery Center, Fort Worth Zoo, Texas Discovery Gardens, and many, many more. “ART EN BLANC: Artist Reception” – On Friday, September 2nd, at 7pm, the Gallery 8680 invites you to Art en Blanc | Everything White, a collaboration 20 artists works showing the strength of white as a color. The FREE show consists of 3E work, painting and photography. It’s truly a must-see exhibition! Inspired by the first official Dîner en Blanc which took place in the Parc de Bagatelle in the Bois de Boulogne. François Pasquier invited a few friends to the Bois de Boulogne one day in June on his return to France after being abroad. To find each other in the park, they all wore white. We invite you to join us (in white!) and enjoy a night of beautiful art, mingling with the artists, and culinary delights! The Gallery 8680, 8680 Main Street. Two ways to purchase your tickets: Purchase online and print your ticket at home, or buy them in person at the Frisco Athletic Center, 5828 Nancy Jane Lane. Parking: A FREE shuttle service will pick you up at Stonebriar mall, parking lot G (north side between Dillard’s and Nordstrom) and drop you at the dance. Embassy Suites valet service is available for $8. The Embassy Suites parking garage is $3, cash only. “Writer Spotlight: Hank Phillippi Ryan” – On Sunday, September 25th, from 2-4pm, come hear special guest of the “Sisters in Crime North Dallas Chapter,” Hank Phillippi Ryan, in the Frisco Public Library. Winner of multiple prestigious awards for crime fiction, including the Mary Higgins Clark Award for her bestselling novel, “The Other Woman,” Ryan will discuss mystery writing and crime fiction. She will also be signing copies of her books for attendees. Save the date. You won’t want to miss it! “Color Me Green 10k, 5k and Caterpillar Dash”- On October 1st, the Frisco Square will be transformed into a Green Square for childhood cancer awareness. The 5th Annual Color Me Green race benefiting TeamConnor Childhood Cancer Foundation brings together childhood cancer patients, advocates, survivors, families and the community to raise awareness and funds to find a cure. The Color Me Green 5k, 10k & Caterpillar Dash kicks off with a 7:30 AM registration and pre-race warm-up, along with a ‘get green’ tent. The Caterpillar Dash one-mile fun run begins at 8 AM and the 10k at 8:30 AM, and the 5k at 9 AM. A Green Party and Awards ceremony begin at 10 AM with a video game truck, face painting, bounce house, and music. Before, during, and after the race, runners and guests can enjoy learning more about healthy living at the Color Me Green Health Fest. Sponsors will have tables set up to promote their healthy lifestyle businesses and products. To register or for more information about Color Me Green, visit www.colormegreen5k.org. “ARTSEEN TOUR” – On Saturday, October 15th, and Sunday, October 16th, Gallery 8680 is hosting the 6th Annual Artseen Tour in Frisco. This unique event merges artists with the community, allowing guests to see how and where artists work. This year, the tour will be focused on Downtown Frisco, taking place along Main Street, between the Dallas North Tollway and Preston Road. If you’re interested in joining us as an artist for this event, please go to artseentour.com to register. Artist entry deadline is September 11th. The games on Saturday at the Star are sold out. This is very disappointing as many students attending these Frisco high schools cannot attend their own Highschool game. Amazing facility, but disappointing experience for these high schoolers!